Visiting some wineries as part of your cycling trip. If you are interested in tasting and finding out about some of the top wines of Provence, we can offer you two possibilities planned and guided by our wine professional Guide (see his CV at the bottom of the page). A third option is you go by yourself we indicated where to go. Option 1. 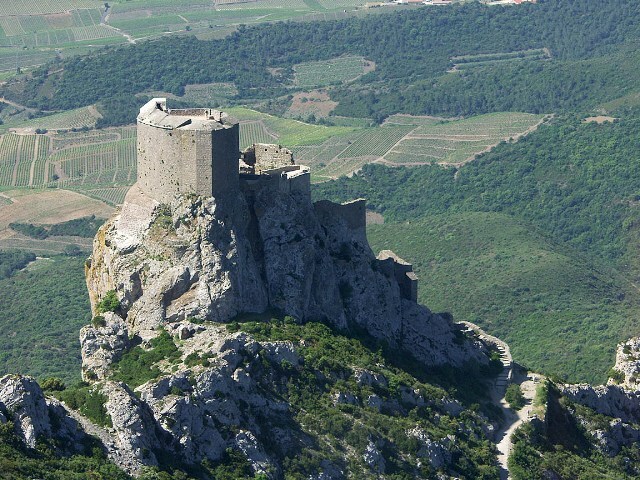 Half-day guided visit to the stunning vineyards and wineries of two top wine domaines in one of the five wine villages, Gigondas, Vacqueyras, Rasteau, Sablet or S?uret that are clustered around the Dentelles de Montmirail Hills. Each half-day visit compares and contrast wines from two different domaines. Our guide explains the elusive concept of “terroir” and demonstrates, in an accessible way, how different terroir, grape varieties, vine-growing and winemaking methods determine the characteristics and quality of the different wines that you taste. The guided visits appeal to all wine drinkers, from those who simply enjoy a glass from time to time, to wine enthusiasts seeking to broaden their understanding. 3. Often contradict each other leaving the visitors confused at best about the region's wines. 4. Winemaking in general and the methods used by each winery. You will then be well armed with general and local wine knowledge to visit other wineries in other wine villages on your cycle route that are interesting contrasts to the wineries you have already visited so as to give you a broad picture of the region's wines. 1. The guide will create specifically tailored guided visits – He will speak directly to you once you have confirmed the booking to establish the things you would like to find out about/learn/discover, etc. He will then plan each of your guided visits on the basis of that discussion. 2. The guide will personally meet the owners of each wine domaine you will visit on your own to plan your tasting and visit (even though it is not guided by him) so you discover something new and different at each wine domaine you visit. 3. The guide will provide you with coherent, consistent and coordinated information about the appellations you will visit and all the wines you will taste during your visits, including wines from the domaines that are not guided by him. This will allow you to appreciate and understand all the wines that you taste in a understandable and coherent way. The guide will happily book/recommend restaurants that list the wines from each of the domaines you visit so you can enjoy lunch / dinner with some of the wines you have tasted during your visits. Price per visit guided: 120 euros per visit or 40 euros per person if there are three or more people. Price per visit not guided: Varies depending on the wine domaine visited. Anything from 2 euros per person upwards depending on the type of visit. "Our guide is a dual British and French national now currently residing in Sablet, Provence. He obtained his final wine qualifications from the Wine & Sprits Education Trust in 1998 and set up a UK wine importing business, specialising in wines from the Southern Rh?e. In 1999, he also commenced a viticultural project in Valr?s, Provence and continues to cultivate and make wines from those vineyards today. Guide has also been involved in several other winemaking projects in Provence and the Languedoc since 2000. Having gained a significant and wide experience of the wine business from vineyard cultivation to winemaking to wine trading, he set up a wine education and wine tour business in 2005 based around the premium wine villages of the Southern Rh?e." Most wineries welcome visitors to taste (and purchase!) their wines. Very few do tours and most of those that do require prior appointments. There may be a small tasting fee at each of the wineries (which they can pay at the time of the visit) if you do not purchase any wine. The guide will arrange for each winery you visit to show the winemaking cellar and point out any interesting things that will not have seen on the guided visits. In the Bordeaux area we have our host guide you at some special wineries. ?Introduction to French Wines at Chateau Haut Garrigue 14.00-16.30.